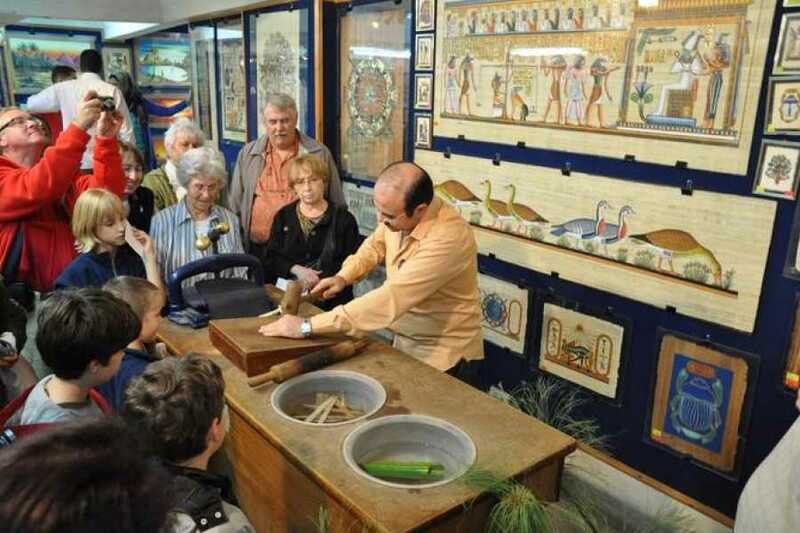 Go behind the scenes during this enriching cultural tour, which gives you exclusive access to a papyrus museum and workshop. Learn about the history of the ancient Egyptian paper and its living heritage along the Nile Delta. Browse a government-approved selection of hand-painted papyrus prints and see for yourself how the time-honored craft is made with a special demonstration. The English word papyrus is derived via Latin, from the Greek, papuros. The Arabic word is Bardy or also Warak Bardy meaning Papyrus paper. It is often claimed that Egyptians referred to papyrus as pa-per-aa, literary meaning, that which is of Pharaoh, apparently indicating that the Egyptian crown owned a monopoly on papyrus production, though no actual ancient text using this term is known. Papyrus was very important to the ancient Egyptians as it helped transform Egyptian society in many ways. Once the technology of papyrus making was developed, its method of production was a closely guarded secret allowing the Egyptians to have a monopoly on it as it became the lifeblood for ancient Egypt. It was even exported to many locations in the ancient world. The raw material of papyrus paper comes from the plant Cyperus papyrus, a long stemmed plant that grows in damp regions of the Nile Delta in Egypt.